Stay In The Comfort Of Your Own Home! In-Home Care Costs Less than Equivalent Assisted Living in most normal cases. 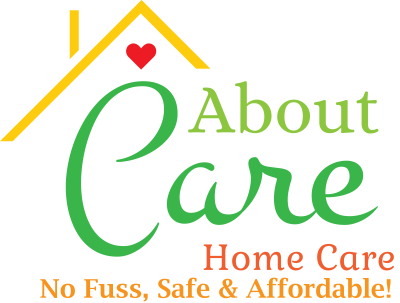 There are many Home Care providers in Arizona, but when families want the highest quality care for their loved one, they choose About Care Home Care. We are a Veteran and nurse-owned company with over 40 years of combined experience that has been providing compassionate care exclusively to Arizona seniors since 2009. Caring for an elderly adult with a chronic illness requires specialized training and experience. Your loved one is cared for by a team of compassionate and skilled home care professionals of the highest calibre; we only hire multi-year experienced and certified CNA’s and nurses who are dedicated to the home care philosophy. Our caregivers are experts in providing care to seniors with Dementia, Alzheimer's, Hospice, Degenerative support, as well as Post-Surgery and Disabled patients. No one should feel alone when looking for quality home care for their loved one. We will be your shoulder to lean on during this delicate time. You are entrusting your loved one’s well-being with our company, and we take that more than just seriously. Fixed rate $330 per day for 24-hour coverage. A great alternative to Assisted Living with care available in your home. Fixed rate at $22 per hour, available for when you need constant and alert care during the day and/or at night. Fixed rate at $23 per hour, includes assistance with 3 meals per day, doctors’ appointments, grocery shopping, and more. Fixed rate at $24 per hour, perfect for meeting most daily needs throughout the day. You are not locked in. You are not moved or have to move. Use us 1 day or 5 years-Its always up to you! Most importantly- You can stay in the comfort of your own home safely!